I’ve always heard Red’s soliloquy to the Stewmaker as having autobiographical overtones. I binge-watched the first season and Red’s statement to Liz that, “If anyone can give me a second chance, it’s you” was still fresh in my mind when I got to Episode 1:4 The Stewmaker. It was this speech that solidified in my mind the sense that Red’s journey was one of seeking redemption; I don’t think I’d even be interested in the series otherwise if there weren’t hope of that. I thought it was incredibly moving. I think that’s when I really fell in love with the writing, with the character of Red, with the potential for the series. “Red: A farmer comes home one day to find that everything that gives meaning to his life is gone. Crops are burned, animals slaughtered, bodies and broken pieces of his life strewn about. Everything that he loved, taken from him. His children. One can only imagine the pit of despair, the hours of Job–like lamentations, the burden of existence. He makes a promise to himself in those dark hours. A life’s work erupts from his knotted mind. Years go by. His suffering becomes complicated. One day he stops. The farmer, who is no longer a farmer sees the wreckage he’s left in his wake. It is now he who burns. It is he who slaughters. And he knows, in his heart, he must pay.❗Doesn’t he, Stanley? “Liz: No, Red. He couldn’t help it. By the time he got to “Maybe he could make amends…” I was in tears and after he killed the Stewmaker – who never offered any evidence he was sorry – I thought the real question had become: maybe it is too late for the Stewmaker, – but is it too late for Red? We still don’t know what happened to Red’s family. We don’t even know who “his family” was. We don’t know if the story he told Madeline Pratt had any truth to it. I guess beyond that, there’s no use in speculating. 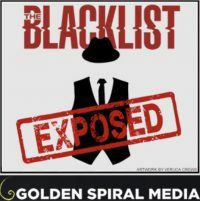 “But what is Red’s motivation for turning over the ‘Blacklist’? Is he a good guy or a bad guy? – ‘I hope that’s a question we can keep alive for a long time,’ Fox said.